James Aloysius Farley (May 30, 1888–June 9, 1976) was arguably the first Irish Catholic politician in American history to achieve success on a national level, serving as Chairman of the New York State Democratic Committee, Chairman of the Democratic National Committee and as Postmaster General simultaneously under the first two administrations of President Franklin D. Roosevelt. Farley opposed Franklin Roosevelt breaking the two term tradition of the Presidency, and broke with Roosevelt on that issue in 1940. Farley, as vindication for his public opposition to FDR's third term and his breaking of the Democratic Party's tradition of two Presidential terms, which had been established by the founder of the Party, Thomas Jefferson. 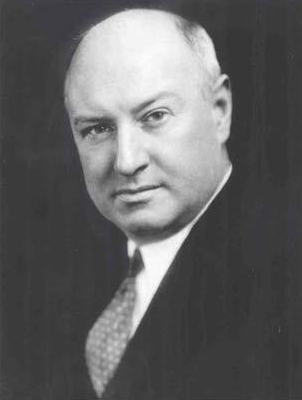 Impressed by his campaign management skills and grateful for victory, President Roosevelt appointed James Farley the nation's 53rd Postmaster General. Declining revenues plagued the Post Office Department during the Depression. The drop began between 1931 and 1932 when postal income plummeted from nearly $657 million to $588 million; it continued dropping in 1933 and 1934. At last, in 1935, finances slowly began to rebound as revenues reached approximately $631 million. The following year revenues again rose to nearly $665 million. Farley's first job during this difficult period was to make certain that postal employees did not join the ranks of unemployed Americans. While postal employment dropped from 254,956 persons in 1929 to 229,646 in June 1934, this reduction largely was due to retirements, deaths, resignations, and other normal causes. 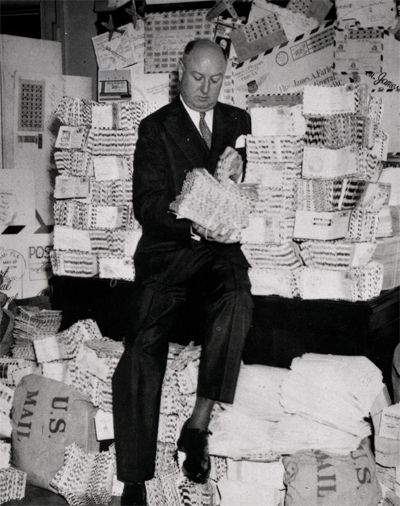 Postmaster General James Farley quickly learned an important lesson about philately. 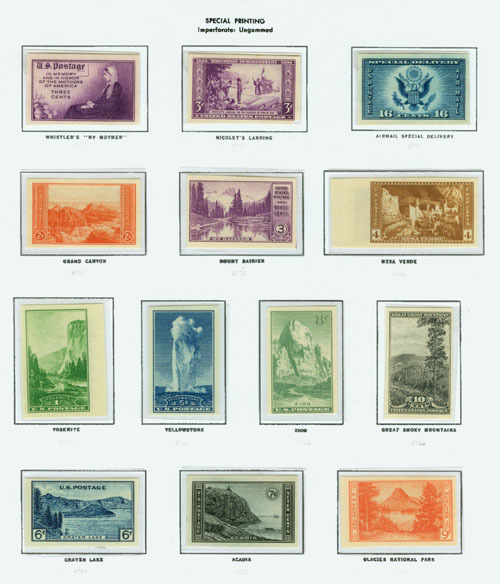 In mid-1934, he ordered the production of sheets of ungummed imperforated stamps to hand out as favors to political friends and other high government officials. He frequently bought imperforate, ungummed, printed sheets of stamps right off the press. Both Farley and FDR signed in the margins. Farley presented the first sheet off the press to FDR and frequently saved the second for his own family and others. He did this twenty times during his tenure. The practice angered the philatelic community and political opponents when exposed. Feeling deprived of access to these unique and invaluable sheets, critics lobbied Congress, demanding justice. President Roosevelt, an avid stamp collector, asked Farley to terminate this policy. To quell the mounting tension, Farley ordered all twenty sheets reprinted in a special printing without gum or perforations and offered for sale to every American who desired the sheets. The reprintings began on March 15, 1935. 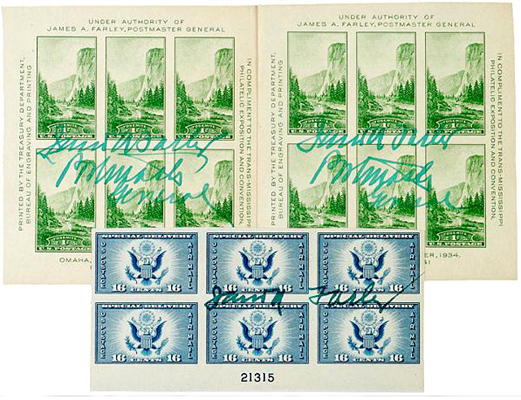 Stamp collectors refer to the scandal and the reprinted sheets as "Farley's Follies." Farley took this lesson to heart and became a strong advocate for philatelists. The public has rarely seen the original full sheets that created the uproar. 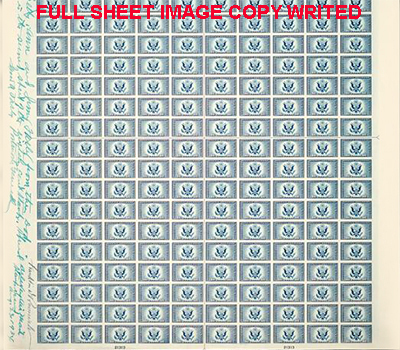 Fifteen of the twenty original uncut press sheets were donated to the Smithsonian Institution by the late PMG James A. Farley. The landmark James Farley Post Office in New York City is designated in his honor and as a monument to his career in public service.